To avoid getting stuck in back traction areas always try to drive on paved roads. Zero traction areas are areas which the vehicles tires have a hard time grabbing. It doesn't matter what you try doing with your own body strength or acceleration, it won't budge. Attempting to keep the accelerator on can be dangerous to you and your vehicle if there are objects near by once it grabs. 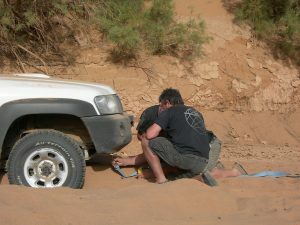 If this has happened to you give us a call for affordable winch out service. KB Camarillow Towing have tow trucks equipped with winch out systems that will get your car out in a jiffy. The technicians have years of experience in winch outs and always show up on time. Winch outs are usually required in mud, sand, deep puddles of water, sink holes, huge potholes, or tall grass/bushy areas since they can reduce the vehicles traction. We're available 24 hours a day anytime you need affordable winch out service in the Oxnard, Ventura, Malibu, Thousand Oaks, or Camarillo area. Roads are sometimes not fully visible when driving in the dark or overcast areas. Lack of vision can cause many drivers to steer off the road into zero traction areas. This is usually how most cars end up needing winch out service. 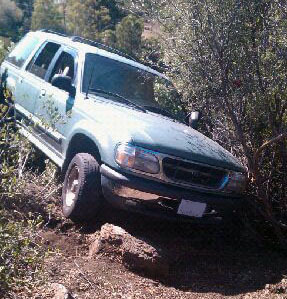 This is why KB Camarillo Towing is available 24 hours a day when you need 24 hour winch out service. Every tow truck is equipped with winch out systems to better assist our clients when they need it. Everything is to better assist our clients with expedited and low cost winch out service. Anytime you need our affordable 24 hour winch out services give us a call. Once you call our operators they will ask about your vehicles issues, make/model, and current location. Once they get the required info they will then dispatch the closest tow truck near you. KB Camarillo Towing is here anytime you need low cost winch out service within the Camarillo and Oxnard area.